EL SEGUNDO, Calif.--(BUSINESS WIRE)--With backyard barbeque season just around the corner, Beyond Meat® is revving up the distribution of its meaty, plant-based sausage. 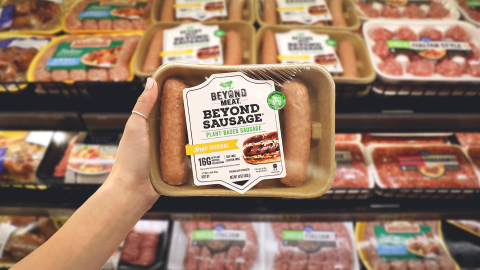 Beyond Sausage is the world's first plant-based sausage that looks, sizzles, and satisfies like pork, but comes with the benefits of plant-based meat. With more protein than pork sausage but 38 percent less saturated fat and no nitrates, gluten, soy or GMOs, Beyond Sausage is the missing link that delivers the satisfying taste and texture of pork sausage, while being better for human health and the environment. Fans looking to try The Future of Protein® can find Beyond Sausage at over 4,000 grocery stores, restaurants and sports stadiums nationwide.